The Texas Department of Transportation is recommending changes that may help reduce the number of deadly wrong-way crashes on Texas highways. In a six-month investigation, NBC 5 Investigates has learned TxDOT has now approved the use of lower “Wrong Way” signs in locations where wrong-way crashes have occurred. In a previous report, NBC 5 Investigates discovered the safety measure was used in other states, though not in Texas where more people are killed in wrong-way crashes than anywhere else in the country. New research suggests that lowering the signs from a height of seven feet to three feet can dramatically reduce wrong-way crashes by making the signs more visible in a driver’s headlights at night. Shane Howell, with Dallas Lite and Barricade, is a sign contractor and is also part of national and state committees that study sign safety. He was surprised to see TxDOT suddenly approve the use of lower signs. “Part of it is the reporting you guys are doing. I think it's making the public aware of it. It's not something that's going to be hidden,” said Howell. 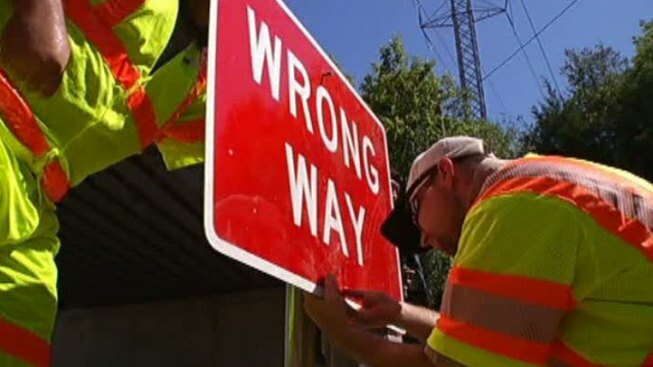 “It’s a significant change and an opportunity for them to try something new,” said Scott Cooner, a highway safety researcher with the Texas Transportation Institute (TTI) who first recommended TxDOT consider lower signs in wrong-way trouble spots more than a decade ago. NBC5 Investigates has learned new local research led by the North Texas Tollway Authority helped convinced TxDOT to make the change. The NTTA has been experimenting with lowered signs on some tollway ramps for the last three years and said, “Initial information indicates we have a 56 percent reduction in wrong-way driving events…” in spots where the signs were lowered. Donna and Tommy Davila lost their pregnant daughter, Sabrina Fernandez, in 2014 in a wrong-way crash just before Christmas when a driver going the wrong way collided head-on with her car on Interstate 30 near Beach Street. In January, using TxDOT data, NBC 5 Investigates discovered I-30 and Beach Street is one of the many wrong-way crash hot spots in North Texas. Five people have been killed in the area in three wrong-way crashes over the last four years. The Davila’s said that stretch of highway should be the first place to get lower signs. “Let's put these signs down and let’s start saving lives. It's enough that so many lives have been taken. Let's start saving lives,” said Donna Davila. “Enough is enough already. I mean we've waited for a long time for them just to get a response. I think the time is now they need to do it,” said Tommy Davila. The Davila’s will never know if lower signs would have saved their daughter -- the wrong-way driver who hit Fernandez had methamphetamine in her system and also died in crash -- but they think TxDOT should try everything possible, starting with lower signs along that deadly stretch of freeway in Fort Worth. “We wait another month - two months to do this, then no telling how many more wrong-way drivers are going to get on these freeways and it’s going to take some other lives -- more families affected,” said Donna Davila. When it comes to catching the attention of intoxicated wrong-way drivers researchers have recently found something that may be even more effective than lower signs. The Texas Transportation Institute put drunken drivers on a test track wearing special eyeglasses that track eye movements. They found drunken drivers look over the hood and down at the pavement. “It's almost a tunnel-vision effect. They're not looking to their left or right -- they're not looking ahead in the driving environment, they're not looking up for signs, they're looking right ahead of them at the pavement,” said Cooner. Because of that tunnel vision effect, red pavement reflectors appeared to be the most effective at catching the attention of drunken drivers. TxDOT has already installed the red reflectors on many freeway ramps. The problems is they get run over and worn off over time, so researchers now suggest TxDOT narrow the width of the arrows so drivers don’t run over the reflectors as often.